At Hunter we define the word sustainability as this: Using approaches to product design and manufacturing that minimize natural resource use while maximizing product quality. 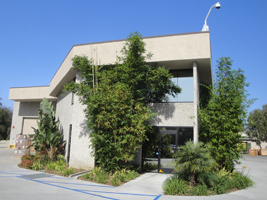 Since Hunter's inception in 1981, our main corporate address has always remained at 1940 Diamond Street in San Marcos, CA. As our business has expanded, our facilities and infrastructure have expanded along with it. What was once a standalone building in a rural San Diego suburb is now a 9-building corporate campus with 6 sister offices on three continents. 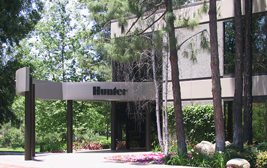 The nine buildings that constitute Hunter's corporate headquarters include our research and development center, engineering, core manufacturing, quality and testing, marketing, global distribution center and employee fitness facilities. Situated within walking distance of one another, our campus buildings allows for a highly effective corporate communications structure, and an increased sense of community among all in the company. From an environmental standpoint, the Hunter campus buildings are built to work with the ultimate in energy and material efficiency. Our distribution center, marketing, and technical support building is a 139,270 square foot LEED Gold registered building that features a barrage of energy-saving features around every corner. The office portion of the building utilizes Green-Label carpeting, office furniture built from 40% recycled materials, energy-star rated appliances, recycle bins at every desk, low-flow restrooms and showers, lockers, and changing rooms for employees who choose to bike, run, or walk to work. The warehouse component of this building includes 162 skylights that provide 100% of daylight during the day. Motion-sensored T-5 fluorescent lights are used when artificial light is needed. The building's climate control uses only the coolest local air to limit the amount of energy used. The building's roof features 140 photovoltaic (PV) units that produce solar-generated voltage back into the local energy grid. Hunter's Energy harvesting system prevents over 300,000 pounds of CO2 from entering the atmosphere each year. When increased product demand forced us to create a new manufacturing facility, we set our sights on an efficient solution. Upon completion, our innovative approach resulted in LEED Silver certification. This achievement was due to detailed features such as priority parking spots for carpools and high efficiency vehicles, showers, changing rooms, and lockers for employees who bike to work, skylights, adjustable shielding and photocell cut-off of lights to reduce impact on surrounding nocturnal habitat, and highly insulated windows, doors, and roll-ups. The building was also constructed out of 90% recycled materials. 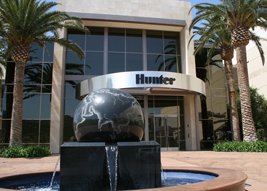 In May 2004, Hunter opened a new state-of-the-art plant in Tijuana, Mexico, to expand manufacturing facilities in the Americas. The plant builds plastic valves and other high-volume products. The building is built with the same quality and safety standards as all other Hunter buildings, and offers 127,000 square feet of manufacturing space. 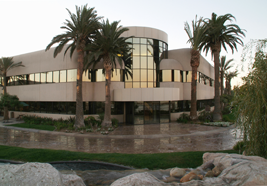 Its proximity to San Diego helps keep both shipping and production costs low. Hunter's international irrigation business spans over 80 countries to ensure our international customers receive the outstanding Hunter service. Hunter's international irrigation business spans over 80 countries on virtually every corner of the globe. In order to support our vast efforts around the world, we placed strategic offices in Spain, China, Australia, and Jordan. Our overseas facilities work in constant communication with our North American headquarters to ensure our international customers receive the outstanding Hunter service and support they deserve.